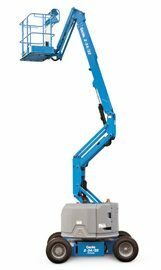 Ideal for confined work spaces at only 58 in (1.47 m) wide with zero tailswing. Maximum drive performance of 35% gradeability and 4.0 mph travel speed. Motor controller eliminates the need for forward/reverse contactors or speed sensors, reducing complexity and improving reliability. Rolls through standard double doorways. 4 ft (1.22 m) jib boom has 139° range of motion allowing positioning above or below horizontal. 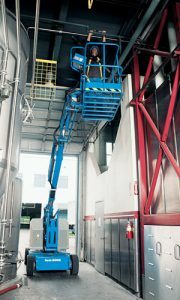 Self-leveling platform features 180° powered horizontal rotation for precise positioning and easy operation. Compact storage length of 13 ft 9 in (4.2 m) and width of 58 in (1.47 m). Easy ascent and descent along a vertical plane without retracting or extending the boom. Automatic hill and ramp braking. Get more information about the Z34/22N.